Tell Gap: Stop Squeezing Profits From Live-Plucking Fur from Screaming Rabbits! We are pleased to announce that after discussions with PETA, Calvin Klein and Tommy Hilfigerâ€”and all other retailers owned by PVH Corp.â€”are banning and pulling from their shelves any products made with angora! Let's keep the momentum going! While PVH is proving that cruelty to animals has no place in its stores, Gap Inc. has failed to take any action whatsoever. These gentle angora rabbits need your help immediately! Please contact Gap Inc. CEO Glenn K. Murphy and ask the companyâ€”which also owns Old Navy, Banana Republic, and Athletaâ€”to stop selling angora products NOW. I am disgusted that even after seeing the shocking video footage of angora rabbits having their fur ripped from their bodies while they scream in pain, Gap Inc. continues to sell angora items. Today, with cruelty-free fabrics available everywhere and cruelty to animals on everyone's radar, there is no excuse for Gap to continue selling angora. 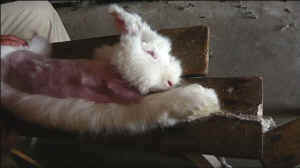 I will not shop at Gap companies and will post on Facebook and tell my friends and family to do the same until Gap bans angora.